Last month, Samsung introduced a Milk Music, a beautiful streaming radio service that it said would come free and ad-free with your new Samsung Galaxy phone. So it wasn't just slick—it offered you a cheaper better option to competitors like Spotify and Pandora. Awesome! Except it's not going to be free and ad-free at all. 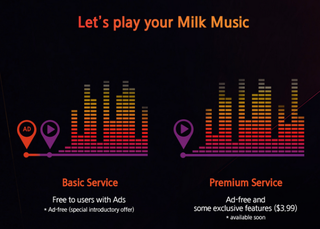 According to a new infographic posted on Samsung Global's website, the Milk Music streaming radio service will now cost $4 per month to ditch the ads in Milk Music, putting Samsung's pricing in line with most of its competitors. It turns out that the "free and ad-free" service was nothing but an introductory offer. Let's look at the original release announcing the service, dated March 8th, 2014 (emphasis mine). Delivering on the passion points of consumers, Samsung Telecommunications America, LLC (Samsung Mobile) today introduced Milk Music™, a new, free and ad-free radio service that offers an effortless and entertaining way to enjoy the music you love and discover new, unexpected music. You can go through and read the whole release. It tells you about all the wonderful advantages about using Milk Music, but it doesn't say it's going to cost you anything ever. It's not n the Milk Music website either. The only place I've been able to find a mention of the limited nature of Milk Music's "free and ad-free" is in the fine print of the Google Play app description. And really, who reads those?